Beki Glyde Brandborg of Helena Montana hails from a long family history of conservation and environmentalism. The most recent step on her journey to make a difference in the world was to install a solar electric system that will produce 100% of her homes electric usage. 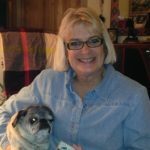 Through the years Brandborg has purchased Energy Star energy efficient appliances, burned firewood to heat her home (with electric backup), used the most efficient form of lighting available (currently LED) and updated the insulation on her 1970s style home. 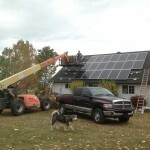 Her newly minted 5.85 kW solar electric system sports 18 – SolarWorld 325 watt modules and a 7600 SolarEdge inverter (ready for battery). Beki knows that the job of caring for the planet and its people is never finished, but for the time being she knows that the energy that her home consumes is generated by the sun. 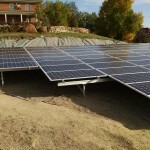 What are the advantages and disadvantages of ground mounts versus roof mounted solar electric modules? Roof Mounted solar photovoltaic modules have the advantages of low cost and height, generally above nearby obstacles and harms way. This economical method utilizes the trusses of the structure to secure the modules. However the roof is not ideal in every case. Perhaps there are significant obstructions to sun exposure on the roof, such as nearby trees, buildings, or terrain. Or the roof itself has obstructions that will interfere with full sun exposure, such as sky lights and chimneys. Remember even the shadow from a deciduous tree limb in winter is substantial enough to reduce the output of a solar module. In these cases a ground mount might be the preferred option. Advantages here include ease of snow removal and variety in the location of the array. We typically work with an excavator and pour concrete to secure the mount which increase the total cost of the system. Electric code also requires a fence surrounding the array to restrict access. Give Dan a call to discuss ideal installation for your solar electric system. 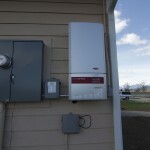 Considering a solar electric system for your home? 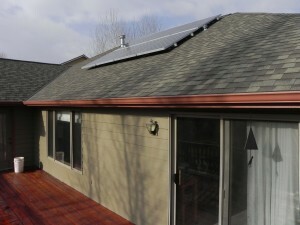 Considering a solar electric system for your home? Begin with your loads, or energy usage. According to the US Energy Information Administration conventional lighting can consume 15% of the average home electric usage on a monthly basis, 30% in commercial structures. 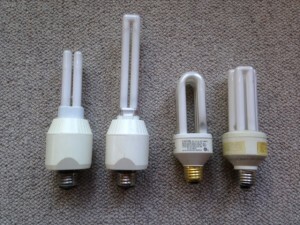 I dug around and found some of the early compact florescent bulbs that we have used. Remember them? Often we needed special fixtures because the ballast and the bulbs were so large. And we always needed enlarged harps for our lamps. Times have change and so have the bulbs. Now we are actually switching to LED technology. But what might be right for you? Check out Consumer Reports latest take on CFs vs LEDs…cost, color, consumption and brightness. Vintage Collection of Compact Florescent Light Bulbs. Click here for What’s new. BOSTON, MA and WASHINGTON, DC – Applauding a record-breaking year, GTM Research and the Solar Energy Industries Association (SEIA) today released the U.S. Solar Market Insight 2014 Year in Reviewreport, the definitive source of installation data, forecasting and policy analysis for the U.S. solar market. Newly installed solar photovoltaic (PV) capacity for year reached a record 6,201 megawatts (MW), growing 30 percent over 2013’s total. An additional 767 MW of concentrating solar power (CSP) came on-line in the same period. Solar accounted for 32 percent of the nation’s new generating capacity in 2014, beating out both wind energy and coal for the second year in a row. Only natural gas constituted a greater share of new generating capacity. In 2014, for the first time in history, each of the three major U.S. market segments – utility, commercial and residential – installed more than a gigawatt (GW) of PV. The U.S. utility-scale segment broke the GW mark in 2011 and has since grown by nearly 1 GW annually. In 2014, 3.9 GW of utility-scale PV projects came on-line with another 14 GW of projects currently under contract. The commercial segment in the U.S. also first installed more than 1 GW in 2011 but has not shared the same success as the utility-scale segment. In 2014, the commercial segment installed just over 1 GW, down 6 percent from 2013. The report notes, “Many factors have contributed to this trend, ranging from tight economics to difficulty financing small commercial installations.” But GTM Research expects 2015 to be a bounce-back year for the commercial segment, highlighted by a resurgence in California. The U.S. residential segment’s 1.2 GW in 2014 marks its first time surpassing 1 GW.. Residential continues to be the fastest-growing market segment in the U.S., with 2014 marking three consecutive years of greater than 50 percent annual growth. GTM Research forecasts the U.S. PV market to grow 31 percent in 2015. The utility segment is expected to account for 59 percent of the forecasted 8.1 GW of PV. • The U.S. installed 6,201 MW of solar PV in 2014, up 30 percent over 2013, making 2014 the largest year ever in terms of PV installations. • Solar provided roughly one third of all new electric generating capacity in the U.S. in 2014. • More than one third of all cumulative operating PV capacity in the U.S. came on-line in 2014. • By the end of 2014, 20 states eclipsed the 100 MW mark for cumulative operating solar PV installations, and California alone is home to 8.7 GW. • For the first time ever, more than half a gigawatt of residential solar installations came on line without any state incentive in 2014. • Growth remains driven primarily by the utility solar PV market, which installed 1.5 GW in Q4 2014, the largest quarterly total ever for any market segment. • PV installations are forecast to reach 8.1 GW in 2015, up 59% over 2014. • 2014 was the largest year ever for concentrating solar power, with 767 MW brought on-line. Notable project completions include the 392 MW Ivanpah project. Genesis Solar project’s second phase of 125 MW and Abengoa’s Mojave Solar (250 MW), which achieved commercial operation in December 2014. • All solar projects completed in 2014 represent $17.8 billion in investment ($13.4 billion in PV and $4.4 billion in CSP). • As of the end of 2014, cumulative operating PV in the U.S. totaled 18.3 GW and cumulative operating CSP totaled 1.7 GW. 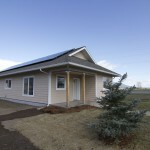 Check Out this Net Zero Habitat for Humanity Home! 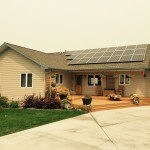 SBS Solar is super excited to show you the latest Habitat for Humanity of Ravalli Co home in Stevensville, Montana. This is an all-electric home with new energy star appliances, LED lighting and a very well insulated envelope. With a $17,000 grant from NorthWestern Energy, SBS Solar was able to install a 30 module, 7.5kWh array with a grid tie inverter and an air source heat pump. We installed this system in December and made the final tie into the grid and installed a net meter on January 2nd. As of this writing 5 months later, the system has made more power than what the home used thru the building process. We utilized electric, milk house, resistant type heaters to keep our workers warm and set the drywall mud. 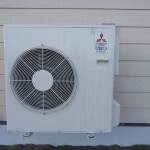 We eventually installed an air source heat pump in March, after the coldest period of winter. 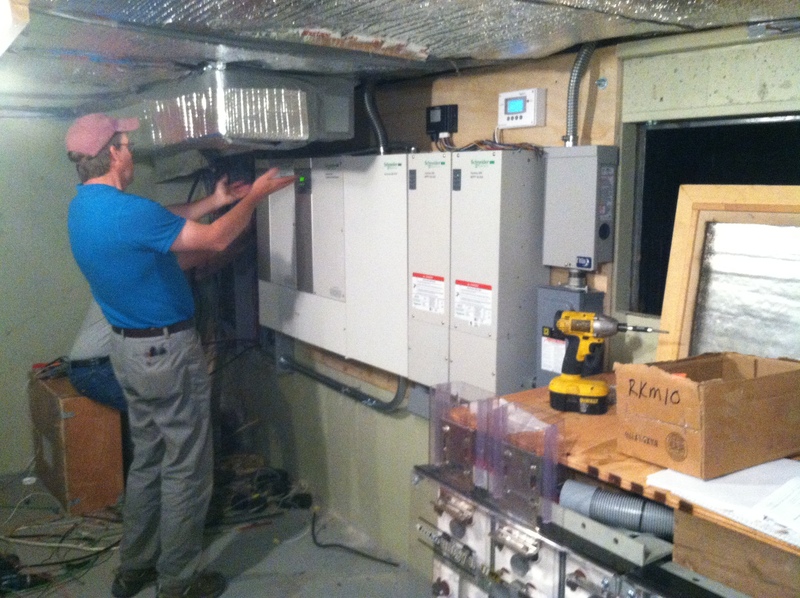 Now that the family has moved in we will see how well all the systems preform and the actual electric usage. Depending on this power usage, we will see if they are actually netting the big Zero at the end of the year. It was a lot of fun, and a honor, being part of the design and building of what is possibly the first net zero home in Western Montana. 1. Why did you decide to install solar panels? When we first bought our home, we realized that the south-facing roof offered an opportunity for solar photovoltaic panels and solar hot water. We want to minimize our environmental impact and installing solar panels is one of the easiest ways to do so. Kristi feels strongly that every south-facing roof is wasted space that should be generating electricity. Industrial forms of “green” energy like commercial wind and solar farms impact a lot of habitat for wildlife, or in the case of solar farms, replace the habitat completely with solar panels. Rooftop solar units have no effect on natural habitat, so they are a much greener way to meet our energy needs than industrial energy facilities. We were considering refinancing our home to take advantage of low-interest rates at about the time we were reminded of the subsidies available for installing solar photovoltaic panels. Once we had the roof evaluated for solar power potential and had received a bid for the installation (along with an estimate of the subsidies), we knew we wanted panels. 2. Did you encounter any challenges during the installation process? The first challenge for us was approval from the homeowners association for our installation. Our installer prepared drawings showing the appearance of the eight panels mounted on our roof. We took to the drawings to our immediate neighbors and discussed our plans. All but one of the neighbors were supportive and the remaining neighbor said that while he didn’t want to look at solar panels on our roof, he understood why we wished to install them and would respect whatever decision the homeowners association reached. The association’s architectural review board approved our request. The next challenge was a couple of tall non-native trees growing in our yard. We were considering having them removed anyway, but did so promptly after we learned that they would shade the panels. We still have some shading in winter from our aspen trees, but the effects on our power production are minimal. We left the trunk of one of the trees standing as a wildlife snag. 3. How long will it take for your system to pay for itself? If the price of electricity stays in the range of 10 cents per kilowatt-hour and our photovoltaic system produces 2,289 kilowatt-hours of electricity each year as estimated, the system should pay for our cost of installation in 15 years (the system has a 25-year warranty). If the price of electricity goes up, the recovery period may be much shorter. If the price of electricity goes down, we may never recover the cost of installation. Our cost was much less than the system’s total cost of $12,629. We received a subsidy of $6,000 from Northwestern Energy for our 2-kilowatt installation and federal (almost S2,000) and state income tax refunds ($1,000). Our system includes microinverters that convert the DC electricity produced at each panel to AC electricity we can use in our home or return to the grid for use by other Northwestern Energy customers. The microinverters reduce the risk that more than one panel will be affected by shading and are provide real-time monitoring of the power being produced by each panel. Our account is credited if we produce more electricity than we use (only likely during the summer). This arrangement allows us to receive full benefit of all the power we produce without requiring us to buy a bank of batteries to store power. 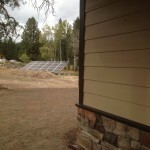 We do expect that our home will be easier to sell and may command a higher price because of the panels. 4. How do you see your solar panels contributing/fitting into the larger Missoula effort against climate change? Our purchase reflects our personal values, greatly influenced by subsidies offered by the power company and federal and state governments. 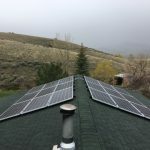 Even though Missoula’s solar energy potential is not as high as in areas with more sun, our community could reduce our environmental impact if more of us took advantage of the subsidies that turn roofs into power plants. 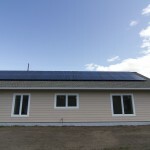 What sort of lessons has the process of installing your own solar panels taught you? Snow melts quickly off our south-facing roof. We had expected the snow to melt just as quickly off the panels. It doesn’t. The panels, mounted an inch or so above the roof, have cold air beneath them. We use a pole-mounted plastic snow rake to clear snow from the panels and onto our deck. The deck never used to get shoveled, but it does now. In general, we were extremely lucky. The cost of solar panels has dropped dramatically in recent years and the cost is still dropping. The installer handled the $6,000 reimbursement from Northwestern Energy so we didn’t have to pay that cost up front. The remaining up-front costs weren’t a problem because we refinanced our home loan when interest rates were at record lows. The panels were installed on schedule at the agreed-upon cost. Within a week after our panels were operating, Northwestern Energy installed the special meter that gives us credit for the electricity we produce. During December, our solar panels produced just 18 percent of the electricity we used, but as the days became longer, the panels produced 30 percent of the electricity we used during January and 43 percent during February. 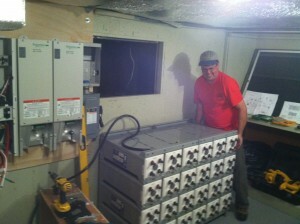 We enjoy having the panels and we’re happy to see them producing more electricity as the days keep getting longer. SBS has had a wonderful and successful time on the side-order list for the City of Missoula’s Green Blocks energy saving program. 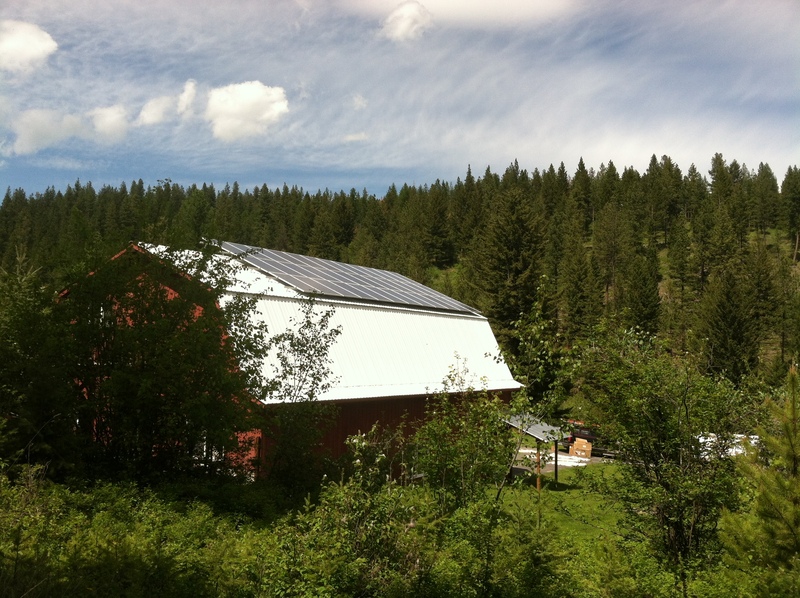 We began work back in the Fall of 2010 by getting 2-inters from the University of Montana’s COT Energy Program and got them fully trained on doing a basic solar site assessment. Our Team ended up doing over 120 assessments over the course of 3-months last fall. They braved blazing sun, side-ways rain and blowing snow from October – December. But, it was well worth it. This spring 2011 marked the final phase of this project. The City added about 60-90 participants to get to their total count of 300. We got ourselves another COT Energy intern for this past Spring and he went out and did about 48 more solar site assessments. Half way through this phase we saw an 18% REDUCTION in the cost to install solar, plus the state and feds decided to KEEP the tax credits in place for renewable, Northwestern Energy gave us a dozen more $6k grants to hand out to customers in good standing, and the MT DEQ revolving loan fund keeps on chugging along (although they are 8-10 weeks out on funding). To top it off, SBS starting taking credit cards for deposits. The wet cold spring made for a slow start, and with the unseasonably cool summer, folks were not thinking about solar. But with the aforementioned incentives, and a little 90 degree weather, we are in full swing. Over half of the installs we’re doing in July and August came from Green Blocks leads and SBS is now booked out until September. Thanks to the City of Missoula for this great opportunity! We’d love to do it again. If you’re interested in information about solar – get in touch: www.SBSlink.com or info@sbslink.com. While there certainly has been a lot of talk lately about the weather, and whether global warming is real or not, the concept of climate change is certainly on our minds (or should be). It seems that catastrophic weather events are more prevalent than ever: from tornadoes to floods to tsunamis, earthquakes, mudslides and volcanic eruptions. In response to these major weather events, and in an effort to gain some knowledge, I have been doing some summer reading. First on the list is a behemoth of a book – and worth the hundreds of pages – Hot, Flat and Crowded by Thomas Friedman. Simply put: We are getting hotter as a globe from fossil fuel energy dependence. We are getting flatter as a world through wireless technology. We are getting more crowded as a world through population growth. This book points out, more than ever, the mounting global energy crisis with the advent of a larger-than-life working-class in major cities around the world, namely China and India. It also details some very viable ways we could remedy the current situation and prevent total global melt-down – like applying the idea of a smart grid to our utility use and billing, efficiency and renewable now (not later), government mandates and crackdown for laziness in getting on board, and even suggesting that the USA needs to getting into a race w/ China to “out green” one another – akin to the space race with former USSR that put a man on the moon in short order. The climate crisis, in reality, is a struggle for the soul of America. It is about whether or not we are still capable — given the ill health of our democracy and the current dominance of wealth over reason — of perceiving important and complex realities clearly enough to promote and protect the sustainable well-being of the many. What hangs in the balance is the future of civilization as we know it. And finally, the shortest of all the reads, an article from Newsweek: “It’s still the Economy, Stupid. 14 Ways to put America back to Work” by 42nd President Bill Clinton. In June 2011 in Chicago, the Clinton Global Initiative (CGI) focused on America for the first time, inviting business and political leaders to make specific commitments in support of the former president’s jobs blueprint, which he details in this article. Here Clinton outlines his plans for economic stimulation. Interestingly enough, the first half circled around energy efficiency and the funding there of. Namely, #2 Cash for Startups, #3 Jobs Galore in Energy, #4 Copy the Empire State Building, #5 Get the Utilities in on the Action, #6 State-by-State Solutions, and #8 Paint ‘Em White. And, really, all fourteen talk about energy conservation relating to economic stimulus in one way or another.